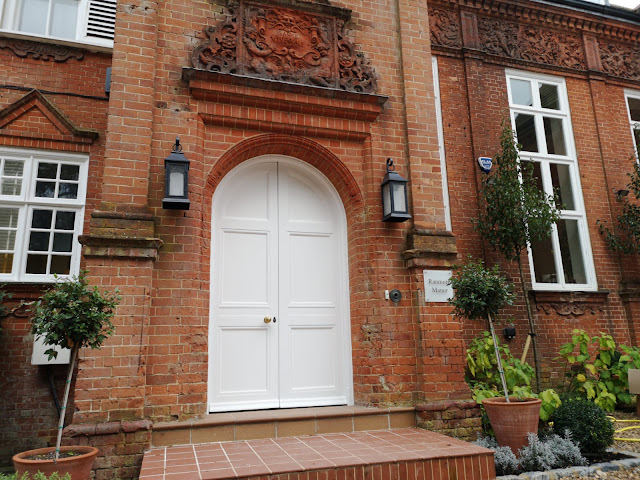 Last summer Rushmoor Painting and Decorating had the privilege of taking on a stunning set of doors belonging to a 140 year old Manor House situated within the Surrey Hills, that as some of you may know is an area of outstanding natural beauty. The features of this house were absolutely breathtaking, the doors however were somewhat lack lustre (at this point). To guests and passers by this set of doors did not say HELLO.... we belong to a beautiful historic house. They clearly had the potential to be a feature of this property but years of neglect and incompetent maintenance left them screaming out for some love. Steve from SJV carpentry (he's on Instagram) had passed on our details to the client and the job was started in August 2018. As with any work we do the job starts with the preparation stage. Starting the prep work whilst the doors were on their hinges and later removing them completely. Due to the fact these doors were not the main security doors meant we could take the doors home and have them setup in a gazebo laying down on work horses. This also made access to all sections and general working height a bit easier. The first step was to focus on all of the flat sections. For this we used a combination of Festool sanders connected to dust extractors to achieve the smoothest surface possible. The sanders we used for this were the RO90, RTS400 and ETS EC 150/5 connected up to a CTL26 E AC and CT MIDI dust extractors. This combination of tools is pivotal in offering the high quality service we provide. During the process of first phase preparation the client made the decision to have these big chunks of wood that were clearly not original removed from the centre of the doors. When they came off they revealed a slim rebated section that looked to have contained a name plate or feature brass plate of some sort in the past. You'll see from the before and after pictures how much better it looks without this section of wood. After the bulk of flat preparation was completed the doors were handed over to SJV carpentry to replace one centre panel which used to be home to the letter box but was unsightly and was also being relocated to a section of wall near the doors. A few sections of unoriginal beading were also replaced in the process due to them being rotten and easily replaced. Once the doors were back we then focused on sanding down the original beading. As you'll see from some of the pictures these areas of beading had not been respected over the years and looked like they had been painted with textured gloss. Not only that but some of the profile was hardly visible or lost completely. This part of the job was one of the most painstaking, finger shredding parts. We say ''one of'' for a reason and that will become clear soon. Once all the initial preparation was completed the next step was to burn out all of the knots in the wood that could potentially bleed later on (even with shellac on them). This process involved heating up the knots with a heat gun until no more sap/resin comes out, being sure to wipe with a rag soaked in methylated spirit to remove the excess. Next up came repairing any areas of rot, filling old door lock sections, reshaping areas of the drip bars and even more painstaking than the sanding part was to reshape the profile of those original areas of beading. All the main fillers used on this were from Repair Care. We used the Dry flex 4 resin for any joints, rot and deep sections like the old lock. For the rest of the surface filling and reshaping of those original beads we used Super finish. This whole process was very repetitive and at times felt never-ending. Fill, sand, clean repeat. At times becoming almost blind to areas, packing up and then the next day noticing another 20 sections that still needed more work. Finally we got to a stage where we felt the doors were ready to have the first coat of primer applied, although we were fully aware that once that first coat of primer was on, it would highlight even more areas that needed filling. After two coats of shellac primer were applied to all of the knots the doors were then hoovered down and wiped over with a water based tack cloth. These doors were being primed with a product from Finnish paint manufacturer Teknos. The product in question was Antistain aqua 2901-00 which is a water based isolating primer which helps hold back any tannin bleed from the wood which can cause a yellowing or discolouration to the finish coat. The method in which we were applying this and all following coats was to spray using an airless system for speed and quality of finish. The primer itself is a two coat system and our aim was to first prime, second fill, sand, second prime. this meant any areas of filler we applied were not going to show through the top coats and look patchy. Antistain aqua is quite a watery primer and it was the first time using it, but application was great and it dried quickly and finished really well. After the first coat of primer was dry it was time for the inevitable second fill on any minor dinks/defects that the primer had highlighted. For this round of filling we opted for a ready mixed fibre reinforced filler from Prestonett. The reason being is we wanted an easy application and easy sanding filler that would mean the first coat of primer was left intact meaning a consistent finish and better protection of the wood and holding back tannin bleed (as teknos specify two coats). Once the the filler was sanded down and the entire door was given a de-nib with 240 grit paper it was then cleaned off and all the joints in the beading and around the drip bars were caulked. After the caulk had been left to fully cure the second coat of Antistain was ready to be applied. Once dry the doors were then lightly sanded using 240 grit paper again to remove any small imperfections that may have settled whilst the paint was drying. This was followed by a vacuum clean down and a wipe down using a new water based tack cloth to avoid any contamination from the previous one. The point behind using water based tack cloths is that they don't leave behind a tacky residue (like traditional tack cloths) on the surface which can impact on the paint being applied. The finish coat being used on this project was again from Teknos and this time it was their Futura aqua 40 (satin) which is a waterborne urethane alkyd based top coat for interior and exterior woodwork. This paint is pretty much our go to paint for interior and exterior woodwork now. Having used this paint on previous jobs we knew exactly how it was going to perform when spraying which was fantastic as always. After the first coat of Futura 40 had been applied it meant standing there staring at it thinking how great it looks (it's a painter thing, we all do it). Prior to the final coat being applied it was the same process as the previous coats. The final light sand this time was with 320 grit paper, vacuum with a soft brush attachment (as had been done all throughout) and wipe down with a water based tack cloth once again. The final coat had been applied and left to cure fully. The door frame in which these doors were surrounded by was a miniature project in it's own right. Between doing the doors the door frame required some serious attention. Most noticeably the bottom right hand section had very bad rot. This was caused by broken tiles (which were acting as a damp course of some sort) which lay below the tiles acting as the steps. It had worked its way up about 4-5 inches up the frame, bare in mind 3-4 inches of the frame were below the step level anyway so total amount of frame that was rotten was more in the region of 8 inches. The process involved completely removing any rotten wood and sanding down the rest of the frame as standard. Next step was to bring the hole where the frame used to sit, up to the level of the tiles, using a concrete we mixed and poured into the cavity. Once the concrete was dry a thick coat of a damp proof membrane paint was applied to the concrete to prevent any moisture rising up through the concrete. After this stage we inserted and secured a sealed section of wood to fill as much of the gap as possible, this was followed by a few applications of Repair care Dry flex 1 resin (the number denotes the drying time). Next up was to fine fill using the Repair care Super finish over the top of the Dry flex 1 where needed and any other areas along the door frame. Once completely sanded down again using a combination of sanders and manually sanding profiled sections it was time for vacuum and wipe down with a tack cloth. The method in which we were painting the frame was to apply using a brush as the size of the frame didn't warrant spraying. It involved doing it in the same way though, which was to first prime, fine fill any minor dinks/defects, sand, caulk, second prime, de-nib, first top coat, de-nib final top coat. The hinges were also given a little bit of love during this whole process as they had previously been caked in paint. a simple soak in hot water, scrub with a wire brush and then polish with some fine wire wool had brought then up like new. A new lock and handle fitted by Steve at SJV carpentry was the final bit to be completed. We now have a beautiful set of doors that reflect the exquisite history of this period home. By now you're probably reflecting on everything you've just read and thought to yourself... all this for two doors and a frame. Yes this is the lengths professional decorators go to in order to achieve perfection (or as close to perfection as possible). So next time a professional decorator provides you with a price and you may feel it seems expensive for what on the surface looks a simple job, just remember the effort that goes in to everything behind the scenes.